A Lightning Bolt of Fun: Michael Brennan’s Electric Girl – LILY & GENEROSO 4EVER! While I regularly fail to maintain a well-balanced food diet, I try my best to stick to a well-balanced media consumption regimen. For some reason, of late, I’ve been directed in my comic book reading toward lighter works than my taste generally prefers. While the short-term break from my preferred dour and serious comics fare has been refreshing, it has also been somewhat enlightening in understanding my own perceptions when simultaneously digesting works of different media forms, styles, genres, or moods. On a recent early morning trip out to Marina del Rey, we immediately turned around our car after we saw the electric blue walls of Dreamworld Comics. Perhaps it was my early morning craving for something to start off the day in a bright way, or perhaps it was the enormous open windows and bright sun filling the room and making me feel far more joyful than I would ever be at nine in the morning, but the turquoise spine and the premise of Michael Brennan’s Electric Girl caught my eye, and I left the shop with it (along with some neon green Hot Wheels for dearest Generoso). Mischief follows Virginia, the protagonist of Electric Girl; Oogleeoog, a goblin of menace, has had his grips on her from the day she was born. As part of his long term plan of interference, Oogleeoog gave Virginia the ability to produce electricity from her own body, and he also graced her with his eternal presence. As a result, Virginia not only manages to shock people and ruin electronics on humid days but also carries trouble for anyone around her when Oogleeoog must execute his goblin duties to make each daily task that much harder, whether that is making a phone call, sleeping, or watching a baseball game. While this premise lured me in and kept me entertained throughout the first volume of the series, when the time arrived to tackle this review, I found little I could say about it, so I began to go through my mental checklist of dissecting my own reaction. Did it evoke a positive or negative type of entertainment? Certainly positive. Did I like the characters? Yes. Did I like the dialog? Yes. Did I like the artwork? Yes. What adjectives would I use to describe this work? Silly, fun…. And at that point in the list, I realized why I had little else to say about Electric Girl. Brennan does not focus the series on some grandiose message about existence and responsibility of a super power; he just wants to make Electric Girl a simple, funny read. As a result, at least in the first volume, Virginia never uses her power as anything more than a convenience, and the ability to conduct electricity does not become more than an annoyance for Virginia, making the entire series feel a little Bewitched or I Dream of Jeannie of the 1960s, entertaining and enjoyable but definitely a bit thin on philosophical and intellectual dimensions because we do not get to see her experience any major struggle or triumph from possessing this quality. Virginia, like Samantha and Jeannie of the aforementioned TV shows is charming and adorable. She similarly gets into quirky situations that always have a layer of cuteness to them in their emergence and solutions, especially when her adorable dog Blammo enters the plot. Virginia’s powers are more of a small eccentricity that lead to party tricks and little giggles than a complex part of her identity. And the same goes for Oogleoog. He is less of a foreboding character and more of a wacky sidekick. His tricks on others cause far less nuisance than one would expect from a goblin, and with every trick he throws in, you almost want to say, “Aw, that darn silly Oogleoog. What did he do this time?” while in your best 1950s housewife pose with hands on your hips and a smirk in knowing that someone has stolen socks off of the clothing line or a cookie from the cookie jar. Despite my own teasing of the basic concepts of Electric Girl, times do exist when you want more simplistic plots and characters, and if you like to keep your comic book consumption as broad as possible, Electric Girl will fit in at a specific time, place, and mood. As long as you take the series at its face value and do not expect to find some profound observation of humanity in it, you’ll have fun reading Electric Girl, exactly like the fun you have watching Bewitched, I Love Lucy, or I Dream of Jeannie. None of these works are life changing, but you come to appreciate them when you have a lot on your mind, when you’re having a bad day, when you’re getting ready for the day, or when you just want something basic in your own complicated reality. These works don’t demand much from you: just some attention and some laughs. They are perfect palette cleansers in between heavy works; they deliver the same uncomplicated joy of a chocolate chip cookie. But, as said before, for a balanced diet, you need more than just the cookie, and for me, reading Electric Girl reminded me that while any piece of media or art has its own inherent value, it also develops separate layers of value based on your own mental state and in comparison to the contributions of other works you enjoy. Consequently, while the simplicity of Electric Girl may feel overly saccharine and juvenile to some, it allowed me to step out of my own ruminating thoughts of existence based on my current piecemeal reading and digestion of Jack Kerouac’s On The Road and other general life circumstances, and there is value in that ability to deliver a quick shot of untaxing amusement, even if it does not answer your own questions about the meaning of life. 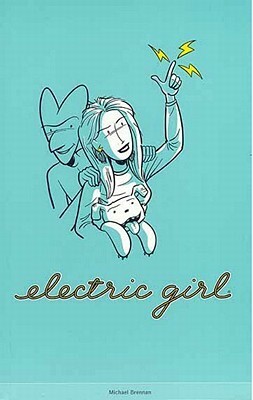 Electric Girl by Michael Brennan is available via AiT/Planetlar.